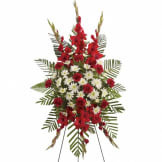 Convey your respect and admiration with this spray of striking red and white funeral flowers. 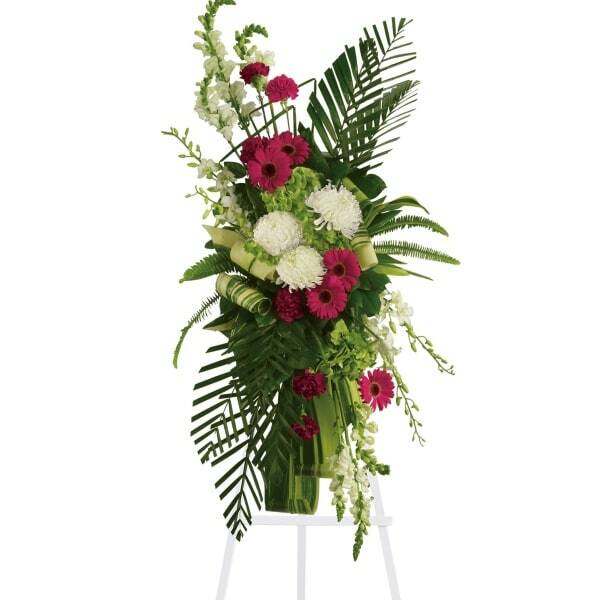 Red gerberas and carnations complement white orchids, snapdragons and chrysanthemums, all set against the deep greens of tropical palm leaves. This standing spray is a unique way to honor the memory of someone close to you. • Beautiful flowers such as red gerberas and carnations, white orchids, snapdragons and chrysanthemums, plus tropical palm leaves and ferns. • An appropriate gift of sent from a family member, friend or business associate. 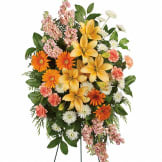 • Arrangement measures approximately 26" W X 46" H.
Flowers will be received by a Rutherford Funeral Homes' staff. 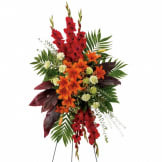 All of our flowers are designed and delivered by hand from a local florist in in Worthington.